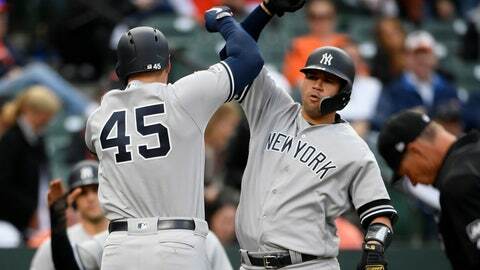 BALTIMORE (AP) — Gleyber Torres and the New York Yankees finally put the bat on the ball in a huge way, and the result was a satisfying victory that wrecked the Baltimore Orioles‘ home opener. Torres’ first home run of the season got New York within 3-1 in the third inning, and his three-run drive in the sixth on an 0-2 pitch from reliever Mike Wright (0-1) put the Yankees up 5-4. Torres’ drive to left took the edge off opening day at Camden Yards and the sellout crowd of 44,182 after the rebuilding Orioles won two of three at both Yankee Stadium and in Toronto. Voit’s three-run drive in the ninth sealed the victory for the Yankees, who beat Baltimore in their own season opener. Yankees: SS Troy Tulowitzki was placed on the injured list with a strained left calf, the 11th Yankee to go on the IL this season. INF Thairo Estrada was recalled. … RHP Dellin Betances (shoulder) was scheduled to have another bullpen throwing session on Friday before facing live hitters. … OF Aaron Hicks (back) was set to start baseball activities Thursday at the team’s spring training complex in Tampa, Florida.